The most radically new and advanced dice strategies ever revealed! Learn advanced playing methods based on real player edges! Learn radical new betting styles for advanced performance! Learn new dice sets for hitting selected numbers! Learn evaluation techniques for your dice shooting performance! Learn how the pyramids can act just like flat walls! Learn about the V-Spread and the Single Point Pop! Learn how to conquer super-bouncy tables! Learn about Dice Correspondence � the new never-revealed truth of dice-control movement! Learn group and team play! Learn brand new throws and dice setting at non-dice-set casinos! Learn how to protect yourself against railbirds and other thieves! Plus: Follow Frank Scoblete and Dominator's adventures as they take on the casinos with smashing results! Plus: The 5-Count and the Captain's Amazing 147-number roll! 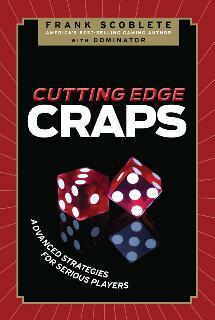 Read best selling author Frank Scoblete�s Cutting Edge Craps: Advanced Strategies for Serious Players. Scoblete, along with Dominator, the world's greatest dice controller, take casino craps to new levels of sophistication and player advantage with never-before-revealed techniques that can make you a serious threat to the casinos. Cutting Edge Craps: Advanced Strategies for Serious Players will turn traditional craps strategies on their head with brand new information from two of the most advanced craps players to ever play the game!